1. Bhangarh Fort – 75 km approx. Located at around 80 kilometres from Jaipur, lays the historic ghost town of Bhangarh. Bhangarh is also in close proximity to the Sariska Tiger Reserve, making it a popular spot for adventurers and tourists. The ancient town is famous for its historic buildings, temples, ruins of an ancient town and the wraithlike fort, which is one of the few places that have been deemed haunted by the State government of Rajasthan. One can visit the ancient Hindu temples dedicated to Hindu deities such as Lord Shiva, Hanuman, Ganesha and Krishna. The town was once a sprawling capital of Maharaja Madho Singh during the 16th century. After the decline of the Mughals and a famine in 1783, it became deserted. 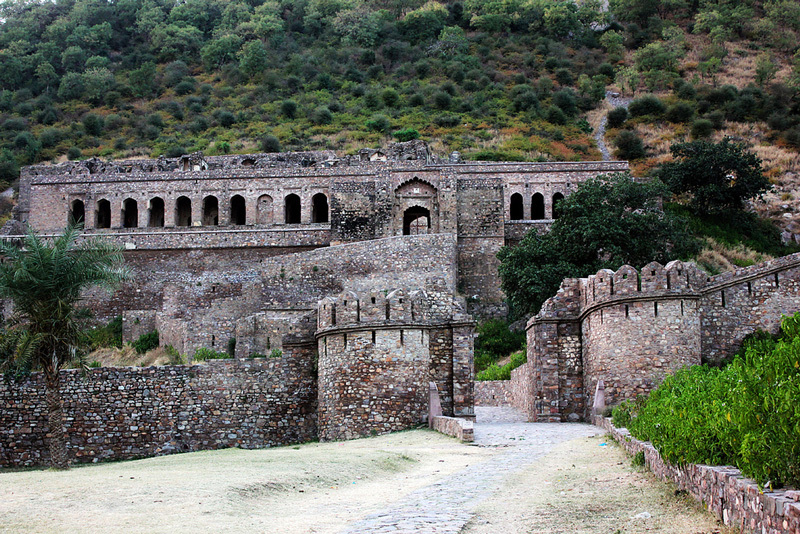 The most captivating part of Bhangarh is indeed the daunting castle of Bhangarh which is believed to be inhibited by the vengeful spirits of the dead. Due to its vile reputation entry to the fort and its precincts is restricted after sundown. 2. Chandlai Lake – 32 km approx. Chandlai Lake is one of the best places to visit during the rainy season in Jaipur. It is located at a short distance of 30 kilometres from Jaipur and is also great for the shutterbugs due to the large number of migratory birds that flock here. The lake and its precincts are also a protected area by the state government and can be reached easily via Highway no. 12. 3. Chand Baori – 93 km approx. Located in the ancient town of Abhaneri at a distance of approximately 90 kilometres from Jaipur, Chand Baori is one of the oldest monuments in Rajasthan. The Chand Baori is essentially a 13-storied step-well, which was built around the 8th century AD. The structure comprises of a 30 meters deep well with around 3,500 steps and is one of the deepest step wells in the country. One can also feel the air temperature cool down while descending the stairs and hence was also used by the locals during peak summers as a gathering place. 4. Mehendipur Balaji – 110 km approx. While it is common to come across several temples in India, a visit to Mehendipur Balaji will ensure a quick encounter with a hint of mysticism that surrounds this country. The temple is dedicated to Lord Balaji which is a name for Lord Hanuman and should not be confused with the Balaji Temple in southern India dedicated to Lord Vishnu. It also enshrines the image of Lord Bhairava (the king of spirits) and is known as the center of ritualistic exorcisms in India. The place is certainly not for the weak hearted as one might encounter hundreds of victims who have been possessed by evil spirits. Located at a distance of around 60 kilometres from Jaipur in the Karauli District, the temple is a must visit place for those who want to witness live exorcisms and feel the eeriness that makes the place so famous. 5. Bairath – 90 km approx. Bairath is the modern name for the ancient city Viratnagar, which was known to be the hiding place for the Pandavas during the final year of their exile. It was also known as the capital of the Matasya kingdom, one of the 16 great kingdoms or Mahajanpadas mentioned in the Vedic texts. The town is well connected with the city of Jaipur via road and rail and is located at a distance of 85 kilometres. Bairath is known for its ancient ruins of Viratnagar and the Buddhist establishment built during the time of Mauryan king Ashoka. 6. Chulgiri – 12 km approx. The Jain Temples at Chulgiri are located at a short distance of approximately 10 kilometers from Jaipur between Jaipur and Agra. Apart from being a place of religious significance, Chulgiri is also a great place for trekking enthusiasts and adventurers who want to have a great view of the Aravali Mountains. The temples are also some of the finest examples of Jain architecture as they are decorated with carved sculptures and pillars made of white stone.